POLITICAL SCIENCE is for everyone ambitious who is interested in the challenges of the present time and whose passion is understanding of the world as well as political and social mechanisms that rule it. Political science studies enable to obtain the extensive knowledge of social sciences. Apart from the issues strictly connected with this field (i.e. political systems, political theory and thought or international relations), political science studies are synthesis of four areas: law (first of all constitutional, EU and international law), sociology, social psychology and history. Historians claim that several dozen of years are needed to create the sufficient time perspective to analyze the political events. This gap is filled exactly by political scientists. Political science studies can have at the same time a profile of regional studies – as in case of the Graduate Programme in Political Science in Warsaw, focused first of all on the EU as well as Central and Eastern Europe. MA studies in political science are not purely theoretical. Thanks to the fact that practitioners of the socio-political life (e.g. politicians, diplomats or administration officials) are a part of the academic staff, these studies consist also of practical courses (e.g. Art of Negotiation). The practical knowledge is developed by political science students also through active involvement in the work of student clubs and scholarly societies. That is why the graduates from these studies are very likely to get good, well paid jobs: in the public administration and self-government, bodies of political parties, social and political organisations, international institutions as well as in media, international corporations and universities. 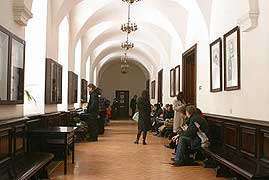 Master’s studies in political science in English – like the programme offered by the Institute of Political Science at the University of Warsaw – create a fantastic opportunity to develop at the same time the knowledge of fascinating social science issues and the English language skills, which is important also from the point of view of employers. The added value is also the multicultural group of students from different continents usually taking part in such programmes. The experiences of students (including diplomats from embassies) are more diverse and political science studies conducted in English more interesting. The students from different countries can enrich courses presenting their perspective on the discussed topics. Internationalisation of this field of study leads also to the inter-university transfers, multiplicity of contacts within the academic circles and student exchanges.